Carlos Alberto Reutemann is arguably the 2nd most famous Argentine Formula 1 driver after 5-time World Champion Juan Manual Fangio (probably Froilan Gonzalez could be the other contender). But for me he ranks 2nd because I watched him on black and white TV racing in the 70s when I was a kid. His nickname “El Lole” comes from a story from the times he was a little kid living in the country side. He was asked what some animals were called and referring to the pigs he said “Lole”…trying to say Los Lechones – Spanish for The Pigs). He was also considered by many as one of the finest drivers…who was unbeatable when at the top of his game but some also claim that when we has not comfortable with the car his performance would slump dramatically. Carlos Alberto Reutemann was born in Santa Fe city, Santa Fe province, on April 12th 1942. His grandfather was Swiss-German, his father Argentine and his mother Italian. His parents lived in a farm and every day he had to ride a horse to go to a humble countryside school. When he was 6 he climbed on a Ford 29 truck and learnt to drive it by himself. He was an avid collector of toy racing cars and a few years later he was driving fast around the country roads between Nelson and Santa Fe. When in High School he already knew that he wanted to be a racer till his bones could take it no more…and then he would retire to leave in a farm. When he was 16 he would create his own racing course by bulldozing part of the fields in his parent’s farm. And after making sure the track was in good shape he would jump to their Rastrojero truck (without the muffler so it would be noisier) and race around. He kept a record of his lap speed and times in order to assess his improvements. When he was 23 he was invited by the brothers Carlos and Américo Grossi to take part in his first race around Córdoba Province. This was on May 30th 1965 and his car was a Fiat 1500 Berlina…the engine broke down during the race and he was unable to finish it. A month and a half later he raced for the 2nd time and he won leaving behind the most famous drivers of this category. Next year he rode a single seater for the first time and raced in the 500 Miles of the Argentine Formula 2. 1968 was not a good year either and he a tried luck in the Turismo de Carretera with Ford Falcons V8. This very same year he drove a Formula 2 Tecno Cosworth owned by Ron Harris. This was his first international appearance. In 1969 he moved to the Formula 2 Mecánica Argentina category and he became champion driving a BWA-Fiat. This enabled him to get the certification to race in Europe. The Argentine Automobile Club put together a team to race in Europe and he became the leader of the 3 drivers of the team due to his dedication and methodological approach. They were living in austere conditions in London along with his wife “Mimicha” and their first daughter Cora. The AAC had purchased 2 cars from Brabham and the first year (1970) for the team was not that good…Reutemann only managed to get a 6th and 9th place in all of the 21 races. But 1971 proved to be a much better year and he came 2nd in the championship that was won by soon to be famous Ronnie Peterson. El Lole was so good defending his position on the track that he was nicknamed “The Wall”. Bernie Ecclestone invited him to race in Brands Hatch in a Formula 1 race (that did not give points to the World Championship). In 1972 he was 29 years old (very old for today’s Formula 1 standards). On his 3rd year in Formula 2 he changed to Motul Rondel Racing team and he finished fourth but on that year he started to race in Formula 1 at the same time…and that is when, in his first official race, he achieved the Pole Position in a Brabham BT34 in Buenos Aires beating the famous Jackie Stewart. His teammate was Graham Hill who qualified 16th on the same race. His was a great race till he had to pit to change his tires and he finished 7th. The rest of the year was not that good except for a win in a non-Championship Brazilian GP (Interlagos) and a 4th place in Canada. Reutemann also suffered a terrible accident in England driving a Brabham owned by Ron Dennis on Easter. One of the wheels came off and when entering a curve the loose wheel overtook him! Next thing he remembers is waking up in the hospital with a broken ankle. He finished his first year in Formula 1 in the 16th place, one behind the famous Hill. In 1973 his team mate was Wilson Fittipaldi Junior. Brabham started the year with the BT37 (the car used during the second part of the previous season and after the 3rd race they changed to the new model (BT42)). This time he achieved his first official Podium (France, 3rd place) followed by another 3rd place in the last race of the year (USA) among other good results. He got more points than his team mate and improved to a 7th final position in the Drivers World Championship while Brabham took 4th in the Constructor’s one. 1974 was a significantly better year for El Lole though it started very badly. Now driving the improved BT44 he qualified 6th in the Argentine GP but his perfect driving put him 1st after 3 laps and he commanded the field with authority. Regretfully when there were 13 laps left it seemed that one of the intakes of the engine started to fall over little by little. The engine started to receive less air and use more fuel. Two laps away from the end of the race t he engine started to cough a bit…until when there was half a lap left and the engine stopped starved of fuel! Reutemann would tell later on that there was enough gas left in the tank to fill one plastic cup…In front of his home crowd he was unable to finish and ended 7th. Nevertheless, President Peron received him as a hero and gave the sad Lole his fountain pen as a present. After another 7th place (Brazil) he obtained his first official Formula 1 win in South Africa leaving the 2nd placed driver 33 seconds behind and beating great drivers in great cars like Lauda and Regazzoni in their Ferraris, Peterson and Ickx in their Lotus and the McLarens of Hulme and Fittipaldi. According to Passarelli and Di Giacomo the rest of the season was not as good as originally seemed because Ecclestone did not have enough sponsors and money and therefore Cosworth would give the latest version of the engines to their other customers. After 6 races with 5 retirements and a 12th place he finally started to score with a 6th in Great Britain and then his second win in Austria followed by another retirement, a 9th in Canada and his final win of the year in the US. He finished 6th in the Drivers’ standings but it is important to mention that Fittipaldi, World Champion that year, had achieved the same number of wins. Only the inconsistent performance of the car with many retirements prevented him from becoming a serious contender for the Championship. The situation improved for Brabham and Ecclestone just before the last race of 1974 with he secured the sponsorship of Martini. With fresh funds the BT44B was a better car and Reutemann was able to fight the championship to Lauda to practically the last race of 1975. He started with a Podium in Buenos Aires (3rd place), a 2nd in South Africa and Sweden (when about to win his tires gave up on him), 3rd in Spain and Belgium and probably one of his most relevant wins: the Nurburgring circuit in Germany. He started the race in the 5th row behind the other great drivers of the time. But the German circuit was a very long and unforgiving one and lap after lap cars started to go off the track (Mass, Jarrier, Scheckter and Donahue), Watson’s and Stuck’s engines said enough, Peterson’s clutch gave up, Pace’s (Carlos’ teammate) and Bambrilla’s cars quit with suspension issues…That left the 2 Ferraris of Lauda and Regazzoni now followed by a distant Reutemann in 3rd place. But Lauda and Regazzoni did not listen to Ferrari’s input and instead of racing in a conservative way they decided to race each other madly as both wanted the win. Regazzoni’s engine packed up and one of Lauda’s tires went very bad (similar to Reutemann in Sweden) and he was forced to pit. By the moment he emerged with a fresh set of tires Reutemann had taken the lead followed by Laffitte that scored Williams first points ever. El Lole was so happy to get the victory in such a difficult track that for the first and only time allowed himself an exultant celebration by dropping the steering wheel and raising his two arms to the sky while the car was still in movement. A bad result in Austria, a 4th place in Italy and a DNF in the last race relegated the Argentine to the 3rd place in the Drivers’ standings. Reutemann outscored his team mate Pace. 1977: the two drivers for Ferrari were Lauda and Reutemann…and the first one was told by Enzo Ferrari that because of what had happened in 1976 he would be the 2nd driver in the team. Clearly Lauda was not going to allow Reutemann to be the #1 and he fought hard to impose his 1st place within Ferrari. During the first race Reutemann was starting from the 3rd row and Lauda on the 2nd but the last had an issue with his engine, retired and the Argentine finished 3rd in front of his own fans. A good start for El Lole against Lauda. For the 2nd race in Brazil a new front wing was available and Lauda did not want it. Reutemann took it and his car became so much better that he left Lauda easily behind during training. Lauda changed his mind and demanded the wing. It was denied by the team and Lauda was fuming. And Reutemann won the race wit h great authority. But Lauda was not going to leave things this way and after the race he flew to Europe to protest to the owner of Fiat, who in turn owns Ferrari. And it seems that his voice was heard clearly and slowly the team attitude seemed to change towards supporting Lauda. So much so that he was put in charge of checking the new aero package for their T2 in SouthAfrica where the next race was going to take place while Reutemann was left in Italy practicing with the old package. Not surprisingly Lauda destroyed Reutemann during the race…With Lauda absent in Spain (probably linked to the injuries the year before) Reutemann finished 2nd and the team mates closely matched in points. During Monaco with Reutemann running 2nd and Lauda 3rd the Argentine was ordered by the Pit to allow the Austrian to overtake him and they finished 2nd Lauda, 3rd Reutemann (Lauda’s political power?...though Reutemann says that Niki was faster…) Just before mid-season (British GP) Lauda was edging Reutemann by only 5 points. But a disappointing performance by Reutemann and a great race for Lauda opened the gap to 11 points. And after the British GP Lauda become unbeatable winning the World Championship while Reutemann finished 4th with Scheckter and Andretti (in the rising Lotus) in between. During the Italian GP Lauda came second to Andretti while Reutemann slid on the oil left on the pavement by the broken car of Giacomelli and crashed. Lauda commented after the race with great acidity and still resented with Reutemann that “my Argentinian friend is very original, he decided to park his car in the oil…” Now with only one point left to grab in the last 3 races Lauda had a surprise and vengeance against Ferrari…he had already signed with Ecclestone so the moment he became World Champion in the following GP he decided not to race for Ferrari anymore and did not participate in the last 2 races of the year! Which opened the door to a young promising Canadian as the new team mate for Carlos: Gilles Villeneuve. Reutemann finished the championship in the 4th place. 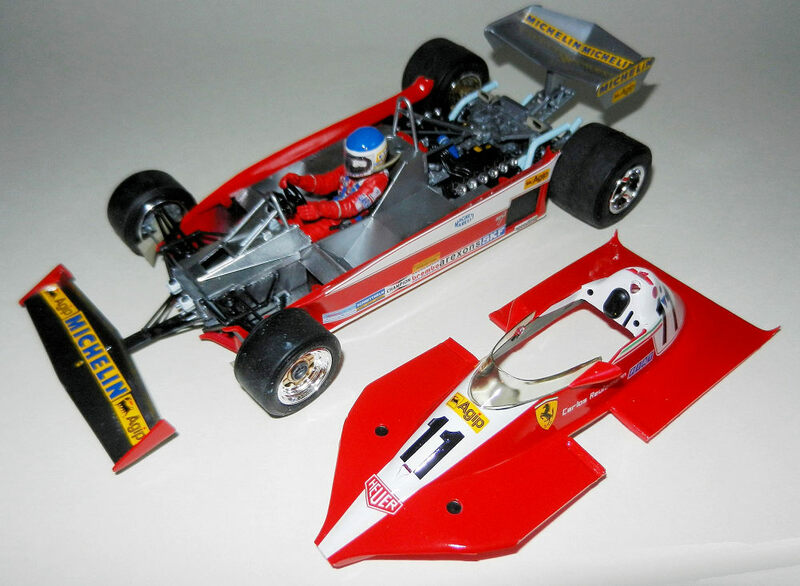 Now on to the part of the history that deals with this model: the Ferrari 312T3. The 312T3 was introduced for Villeneuve and Reutemann at the third race of the 1978 season and during the first 2 races they drove the old 312T2 from 1977. The car featured the same flat 12 engine as had been used since 1970, albeit tuned to give around 515 bhp. The chassis was completely new, with a new monocoque structure and a different suspension arrangement, designed to work with the Michelin tires. The work on the Michelin tires was done by Reutemann during thousands of miles of tests. This helped develop them to a point where they could maximize their performance for the new car. The bodywork was visibly very different, with a flatter top to the body, allowing improved air flow to the rear wing. The first race in 1978 took place in Argentina and we had Andretti and Reutemann in the first row. But after the start El Lole started to fade away with tires problems thus finishing 7th. A disappointing home GP. The next race was in Brazil and was the first one where (though still on the T2) the Ferrari used the new Michelin radials. Reutemann dominated the race in such a way that when the cars crossed the finish line he was more than 1 minute ahead of the 2nd car! The new tires had worked to perfection. During this year the Lotus cars had completely developed the Ground Effect car that had started to shine the year before. And they become a great challenger to the powerful Ferraris (that might not have had a good aero package that suited the Michelins as well as the T2). The third race took place in South Africa and Reutemann retired while Lotus and Good Year increased the rate of development of their tires in order to catch up with Michelin. Next was the US West GP that took place in Long Beach. The Ferraris of Villeneuve and Reutemann dominated qualy and locked the front row. Villeneuve took the lead while Reutemann dropped to fourth with the Brabhams of Watson and Lauda in between. But soon both of Ecclestone’s drivers left the race with mechanical problems and Villeneuve crashed with a backmarker leaving Reutemann first. He was not challenged for the rest of the race and he won for the first time for Ferrari with Andretti second and Depallier third. In Monaco Reutemann took pole again but he crashed with Hunt and had to pit for repairs. That destroyed his race and he finished 8th. Then on to Belgium where the Lotus really started to show the potential and Andretti took pole with Reutemann starting 2nd. The start was not good for the Argentine and he dropped to 4th. Then Villeneuve had an accident and Peterson had to pit for tires leaving the fast approaching Reutemann 2nd. With new tires Peterson passed Reutemann who finished 3rd. Andretti was now clearly leading the Championship. Sweden was another race to forget for Reutemann finishing 10th while Andretti retired and Lauda won with the Fan-car which was never used again due to the complaints from the other teams. In France Reutemann finished 18th (!) while Andretti won again followed by Peterson in the other Lotus 79. …in West Germany the Lotus duet was again unbeatable…Andretti took his 5th win and Reutemann had to retire with mechanical problems. In Austria Reutemann was doing quite well taking 2nd from Andretti during the race but when he tried to reclaim the place he collided with the Argentine. Andretti was out and Reutemann lost 2 places. Then it started to rain and Reutemann spun off. The marshalls pushed his car out of a dangerous place and he resumed the race. With a reduced rainfall Reutemann passed Lauda for 3rd place but then he was Black flagged because he had been pushed back on the track (outside help). Peterson eventually won the race. At this point in the year there were already conversations to form the teams for the following year. Scheckter was the new figure for Ferrari with a salary of $600,000 against the $150,000 of the Argentine with Villeneuve about to be shown the door. But Reutemann did not like the fact that he was going to be 2nd in Ferrari and with Colin Chapman not going renew Peterson there was an opening in the mighty Lotus. Reutemann took the chance and apparently in the same day when they were going to tell Villeneuve that he was not going to race for Ferrari in 79 Reutemann was informing Enzo Ferrari that he was leaving the team. Such was the panic that Ferrari run out of the office to tell his 2nd in command not to fire Villeneuve as now they needed him! But the contract for Reutemann were not that good in Lotus: 2nd driver behind Andretti, the “muletto” (spare car) would not be available to him and also he would not be paid by Louts but by Good Year. Lotus would only take care of the bonuses/prizes. I remember watching the next race on our black and white TV. Italy (Monza) and the start was a terrible mess. Cars collided, caught fire and Ronnie Peterson had his two legs destroyed in the accident. He died the following day due to a blood clot forming in his blood stream. When the race restarted 4 hours later Andretti and Villeneuve jump started and were handed a 1 minute penalty. Andretti crossed the line first followed by Villeneuve, Lauda, Watson and Reutemann. But when that 1 minute was added the podium was for Lauda, Watson and Reutemann. Due to the death of Peterson Andretti became the world champion. The next race was the US East GP. Andretti, still shaken, took the lead with Reutemann and Villeneuve following and then Alan Jones in the now climbing Williams 4th. Andretti’s car was not running fine with brakes issues and then Reutemann and Villeneuve passed him very easily. Villeneuve’s engine finally gave up and Reutemann won with ease followed by Jones and Scheckter. The last race of the year (and for Reutemann in Ferrari) took place in Canada. It was the first time it was going to take place in the Island in Montreal. JP Jarier was in the Lotus replacing Peterson. Villeneuve overtook Jarier mid race and won his first race with Scheckter 2nd and Reutemann 3rd. 2018 was the 40th anniversary of that race that took place in Montreal and for the first time I went to a Formula 1 GP with my friend Ben and his son from the IMPS London and another fellow member (Duncan). It was a very special event as Jacques Villeneuve, Canadian F1 champion with Williams in the 90s, led the Drivers’ Parade in the same car that his dad Gilles drove in 1978 to his first F1 win. A great moment…and I bought a T-shirt that reflects that anniversary with Villeneuve holding the Canadian flag after his win. Scott has made a thorough preview at this link. The big advantage over the more readily available original kit is that the white of the decals is white and not ivory. Therefore I decided to go with this version of the T3 though I was going to have to paint over the clear parts…else I would have had to purchase aftermarket decals elsewhere. Though this was my second F1 model (the first one being the Fernando Alonso’s Renault manufactured by Heller which was a Christmas present for my sister) in this case it was the first one in which the engine had to be built. I assembled all the major and minor components of the engine based on what colour they were to be painted. Then using Model Master Acryl all the subcomponents were spray painted following the instructions. I tried to use the aluminum foil supplied by Tamiya but being also a first for me I did not do a good job ending up with wrinkles in the area ahead of the steering wheel. Therefore I removed it and painted it, like all Chrome parts, using a combination of Black followed by Alclad II Chrome. It worked pretty well. The engine went together with little problems and the flexible pipes/wiring supplied by Tamiya were glued in place. The chassis is very easy to put together. In this case and because it is barely visible I used the foil for the upper side of the floor. Screens were painted black and dry brushed in silver. 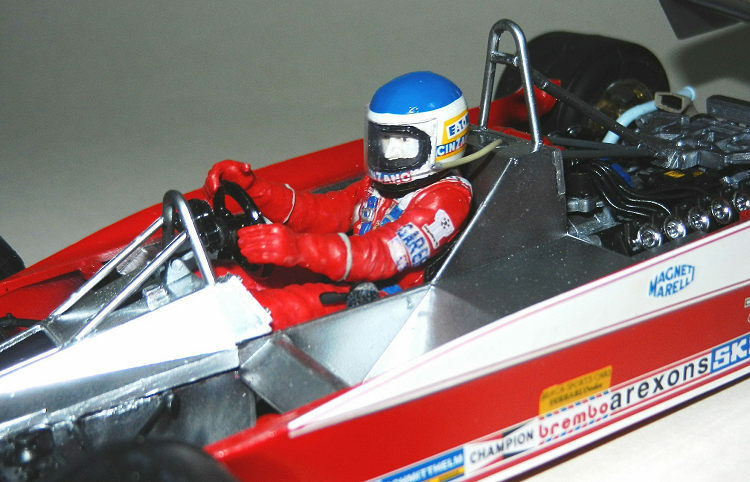 I put together the driver (Reutemann) minus the arms which were to be installed once he was sitting in the car. The body of the car received a coat of White Premier (ModelMaster Acryl) followed by several coats of ModelMaster Guards Red which is pretty decent match for the Ferrari red from my point of view. The floor (undersides) was painted in aluminum with some black to make it dirty. There was no need of Future as Guards Red has a gloss finish. The front wing was painted Chrome with Alclad II and the sides of it handbrushed in red. Testor’s gold was used for the center of the rims of the wheels. The driver was painted with a brush with Guards Red and some grey around the edge of the gloves. The face was painted white (the anti-flame mask) with the exposed area around the eyes with Skin. The eyes were also painted white with black pupils and a drop of Future. The harness was painted blue with details in Chrome silver. The particularity of the Tamiya decals is that they really need to be soaked in warm water. Else it takes ages (if ever) to release from the backing paper. Attention had to be paid to the actual decals and position on the car because there are small differences from race to race. I found some good pictures of the Watkins Glenn winning car. For instance the “11” behind the driver has the two digits separated further than what Tamiya gives you. So I had to cut the decal in half and position them properly. At this point, with the decals dry and properly set, I realized there is an access “port” between the “1”s on the left side. With a small drill I created the hole and painted it aluminum with a brush. Another decal that should be used and is not present in the Tamiya kit is the yellow one with the name of the Ferrari Dealer. This one I had to create using a picture from the web and white decal paper. MicroSet and Sol were used to help the decals conform to the body of the car. Decals for the overalls had to be created as they are not for sale in the aftermarket. Going thru several pictures of Reutemann on line I was able to find decent shots that allowed me to copy the badges, size them properly and print them in white decal paper. After giving them a coat with the liquid decal solution from the same manufacturer of Set and Sol I was able to trim them very carefully and apply them. Some of them were extremely tricky as I had to cut them in a way that represented the badges sitting beneath the harness! Therefore in some cases almost nothing of them is visible…One of the ones that turn out to be the best is the one on Reutemann’s left shoulder and it is the one that represents the Football World Cup that took place in Argentina in 1978 (soccer for those in North America…but let’s call the sport as it should be called…Football). The ones for the helmet are supplied by Tamiya and are very good. The engine, transmission were installed to the chassis. At this point I sat the hood over the car and found that now that I had all the little bits of the engine in place the hood would not properly sit down like during the dry fitting. There was a gap in the area of the side pods. It was clear that one of the big culprits were the 2 ducts present in the trailing edge of the hood. These fed air to the brakes…Thinking that these might have been too much curved down I checked the references…and lo and behold! These ducts are not present in the car that won Watkins Glenn! Therefore I cut out the ducts present in the hood but that was not enough. These start to run and go deep into the hood before the trailing edge. So I was forced to cover those gaps using plasticard, putty and sandpaper and in the process destroying the beautiful painted finish I had achieved. I had to re-apply (masking the decals with masking tape and paper) the White Premier, Guards Red and Future. The finish was not as good as the original but after 3 frustrating nights I decided it was good enough for me. The yellow tinted windshield (should be blue tinted) was glued in place with no problem after the rear mirrors were attached. After spraying his body with ModelMaster Acryl Flat Clear the driver was installed (a little bit too low…). The helmet was brushed with Future and I scratch built the visor (as it should be clear and not yellow tinted! Besides the Tamiya part is too thick) that I attached with Superglue. Arms were positioned holding the steering wheel (that sports a very tiny Ferrari decal) and corrector fluid and paint covered the union of these and the torso. A small strand of flexible plastic was added to the side of the helmet and represents the tube that feeds water to the driver. I glued the front and back wings, attached the wheels and presented the hood. 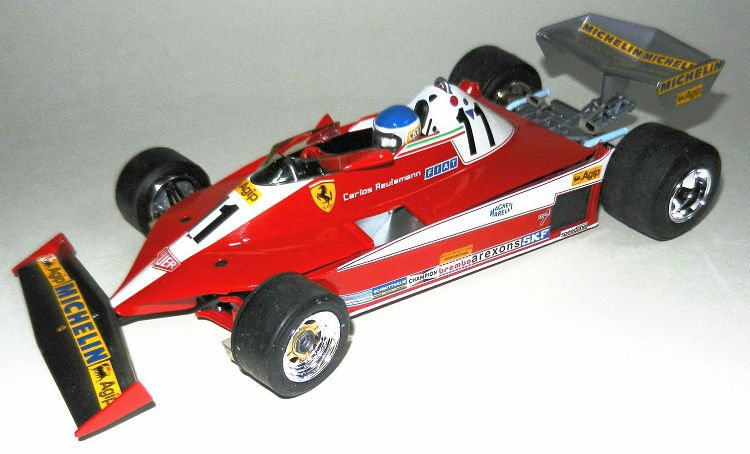 With this the victorious Ferrari 312T3 from Watkins Glen 1978 was finished. A very nice kit that only needs to be adapted based on what version of the car you want to represent.